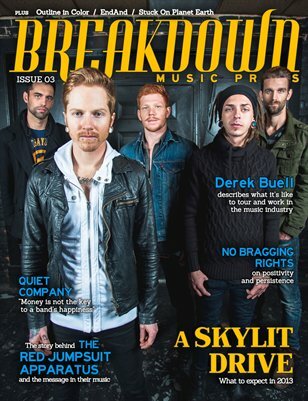 Breakdown is a music magazine focused on bringing you closer to the music industry. Our ultimate goal is to connect with an audience of people who have a dream involving in the music industry in some way or just to become closer to the industry and get to really know the people involved. We want to provide an insight for our readers about the industry and encourage them to reach for their dreams. What fuels the people whose lives revolve around music? What are the everyday hardships they face and how have they overcome these issues? What were the keys behind their success or how did they even begin to get involved? These are just a few of the questions we hope to explore with interviews with your favorite bands and other faces from the industry.